CarGurus has 402 nationwide R8 listings starting at $48,523. The 2009 Audi R8 has been described as “an engineering marvel” and “the best Audi yet.” This feature-laden luxury sports car won big at its intro, the 2008 New York Auto Show, and certainly has the looks and the oomph (and the price) to take on its major competition: the BMW M6, Porsche 911, and Aston Martin Vantage. Slick and distinctly aggressive, the '09 R8 quattro coupe carries a 4.2-liter, DOHC 32-valve FSI V8 and can be ordered with either a standard six-speed manual gearbox or Audi's R-tronic sequential-shift gearbox with a joystick shifter located on the center console and shift paddles mounted on the steering wheel - essentially, an automatic with attitude. In either configuration, the 4.2-liter V8 cranks out 420 hp at 7,800 RPM and generates 317 lb-ft of torque between 4,500 and 6,000 RPM. Most of this torque is retained whole from 3,500 RPM to 7,600 RPM, so plenty of power gets from the drivetrain to the road. 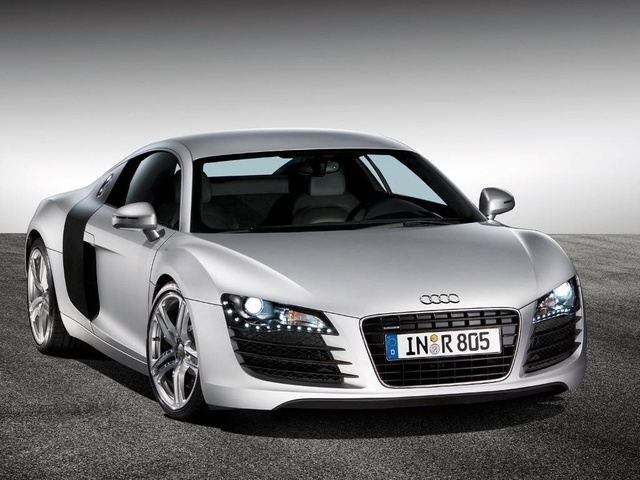 Audi-USA claims that the 2009 Audi R8 was conservatively clocked at 0-60 in 4.4 seconds and touts a top speed of 187 mph. The EPA estimates mileage for the 2009 R8 to be 13/20 mpg with the six-speed manual transmission. Did I mention that the ’09 Audi R8 is loaded with standard luxury features? Just a sampling include 19-inch by 8.5-inch front and 19-inch by 11-inch rear, five-arm, double-spoke alloy wheels and front and rear four-link suspension with adaptive damping shocks that can be electronically controlled for a sportier ride with excellent handling or a comfortable cruise in any weather. Other standard features include automatic A/C, cruise control, Bluetooth hands-free communication technology, a six-disc CD/MP3 player with 145 watts, seven speakers, and Sirius satellite radio, a multi-function, entry/exit-friendly flat-bottomed, leather-wrapped steering wheel, a driver information system with an onboard computer, ten-way power-adjustable front seats, a single-frame glossy black grille, an automatically deployed rear spoiler, bi-Xenon headlights, and LED running and signal lights. Options for the ’09 R8 include a Bang & Olufsen Premium Sound System that packs 465 watts, a subwoofer, and 12 speakers, an Enhanced Leather Package, a radio/nav system with large color monitor and MMI keypad, Carbon Sigma interior trim, side blade and/or engine compartment cover – all sold separately – as well as the Audi Nav-plus system, front and rear parking sensors, rear-view camera, polished alloy wheels, and a black Alcantara headliner. Safety isn’t overlooked amid the luxury, the power and the styling. Standard safety features include four-wheel disc ABS with electronic brakeforce distribution, the Electronic Stability Program (ESP) with “Sport” and “Disable” settings and anti-slip regulation (ASP), an anti-theft alarm, six airbags in various deployment configurations, a crash sensor, and side intrusion door beams. The R8 is not crash-test rated by either the NHTSA or the IIHS. 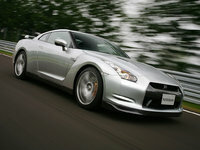 The only negative heard regarding the 2009 Audi R8 was that it isn’t as fast as the Nissan GT-R. Go figure! What's your take on the 2009 Audi R8? r8guru wtf is this guy talking about. Have you driven a 2009 Audi R8? Can You Tell Me Why My Listing Is Not Posted? 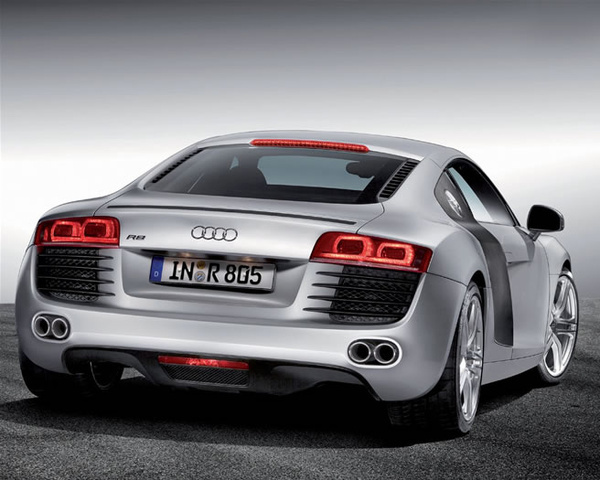 i love the front of the audi r8 2008 but love the back of the audi r8 2009 !!!!! What Do You Think Of The 2009 Audi R8?